December Dev Derby Goes Offline! 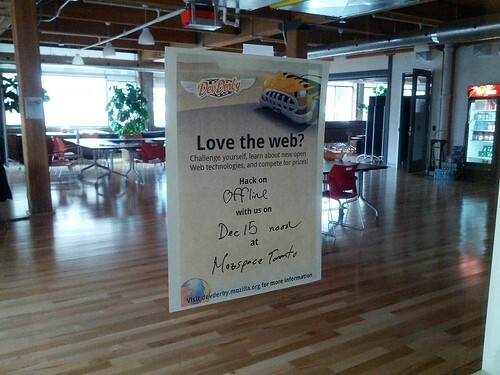 | Mozilla T.O. Join us on December 15th from 11am – 5pm EST to see what you can do Offline with Mozillian Josh Matthews presenting. For a few months now, Mozillians Toronto has been working on a new type of event. It’s a bit of a hack day with a twist! Each month the Mozilla Developer Network holds a contest based on an open web technology. Entrants create a demo showing off what that web technology can do and enter them for the chance to win prizes – though as John Karahalis has learned, many entrants don’t realize there are prizes and enter anyway! The brilliant minds here in the fledgling Toronto community came up with the idea to hold a hack day for local hackers who wanted to work on demos while taking advantage of Mozilla Toronto’s community space. We brainstormed that idea and added an “expert” presenter to kick off the day with a presentation on what the web technology can do and help answer people’s questions as they hack their demo. We really want to see everyone come out to these events – regardless of skill level, gender or dietary restrictions. Mozillians Toronto is about building a community and we’ll do what we can to make sure everyone feels welcome. Because we include a presenter and a social setting, this format is great for the new hacker who might not feel confident enough to work on a demo at home. It’s a great format for a more accomplished hacker to practice their teaching skills, or to brush up on the monthly topic. We even welcome non-hackers! Come out to watch the presentation and see people’s demos at the end of the day. In the do my homework for me homework-writer.com second paragraph, go to the heart of the book. This looks like a lot of fun. What’s up for February?